Lotus Krokus is the project of Danish flowerpower freak, Michael Marino. He has produced 2 records on the Orpheus label. The music is really special Danish folk. Recorded live at the commune where he lives this really captures the feelings of the hippie spirit. 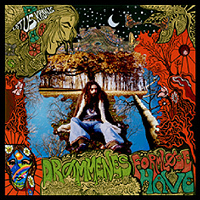 Drømmenes Formløse was released in 2005 and mostly just Michael playing acoustic guitars and other instruments with a few other people on other instruments on a couple of tracks. A good collection of happy, folky hippie music singing about some strange and interesting things. 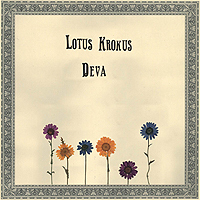 Deva, is his second record and musically more diverse but in the same vein. It starts off with Svysayer, a happy track with banjo, jew’s harp and hand drums and some funny lyrics. Et Eventyr follows in the footsteps and tells a nice adventure story. Natteraven features Palle (whos studio this was recorded) on organ. Nu Dorsen Vinden is a slower more blues and a bit dark track but still very melodic. Huest på Bakken is an off kilter track, a little jazzy and spacey with organ. Nattens sidste Time. This track is played with a small party going on in the background. You hear Michael or someone else try to shhhh people a bit. Happy song with flute and bongos as well. Ud over Kanten features some backing vocals and nice piano. The title track, Deva is a great instrumental track. I wish there were more tracks like this one. A real stand out. The LP ends with Danser med Snefnug. It is a trure winter ballad, beautiful and a bit spooky! A promising young Danish artist. Over all these are quite nice folk rock records and should appeal to a wide range of Danish people as it is not too psychedelic or strange and all sung in Danish. Quite happy music.